Whether adorning notebooks, t-shirts, or a million other beloved knick-knacks, Hello Kitty held a strong place in our childhood. For the first time ever, the adorable, pink bowed character is now claiming her place in the culinary world, with the arrival of the Hello Kitty Grand Cafe this past weekend in Irvine, California. The restaurant, which opened on Friday in the Irvine Spectrum Center, offers two distinct spaces: a fast-casual cafe serving grab-and-go sweets, like made-to-order mini matcha donuts, open daily to the public, and a private room designed to host parties for afternoon tea and specialty cocktail programs. Wednesday to Sunday, a reservation at the pretty-in-pink Bow Room at Hello Kitty Grand Cafe offers an intimate and adorable setting for afternoon tea, with fresh fruit, classic tea sandwiches, and a proper selection of sweets, including scones, cupcakes, macarons, and chocolate cake, along with an extensive array of black, green, herbal, and oolong teas. After dark, the room transforms into an adorable cocktail den, with adult refreshments of the craft variety. Cozy up to the bubblegum bar and try the You Had Me at Hello, made with Cachaca, Aperol, lemon, sherry, and pineapple, or the smoky Dear Daniel, featuring mezcal, pineapple, lime, and salted coconut whip. There’s also wine by the glass and bottle, including a selection of Hello Kitty brand sparkling rosé, prosecco, and Pinot Grigio. 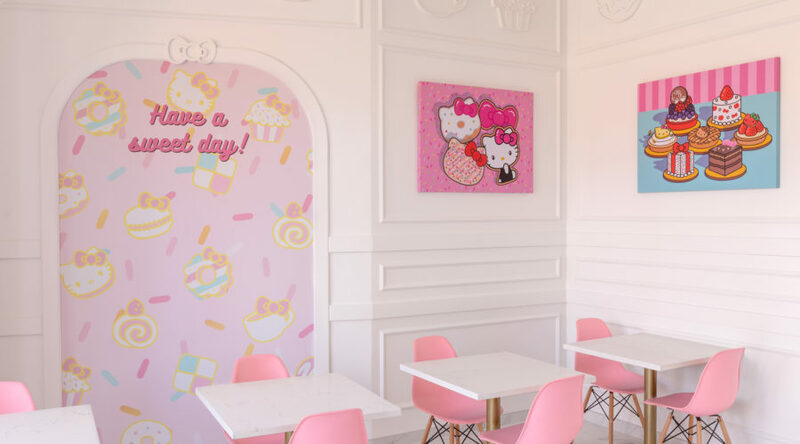 Though the brand has two traveling food trucks and a couple mini-cafes in the U.S. (including in Rancho Cucamonga and San Jose, California), Irvine’s new spot is the first brick-and-mortar concept cafe to feature the iconic Hello Kitty character.